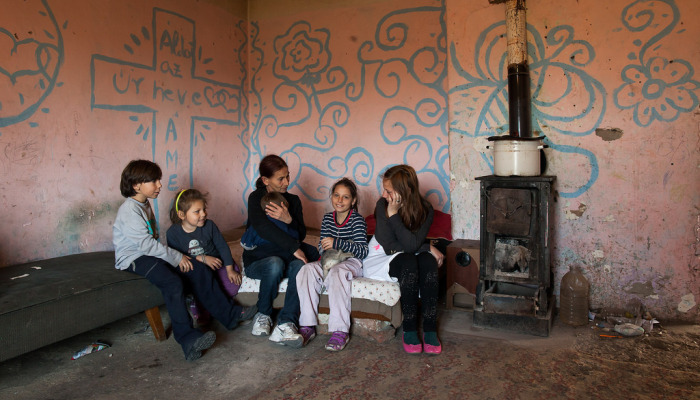 Betti tried to continue her studies but left because she was the only Gypsy at the school. Attila was completely dissuaded from studying. A “B” grade is a bad grade for Tünde, and Joseph doesn’t want to be a public works employee like his father. This article presents 13 disenfranchised families in which the parents are afraid their children might drop out of school as they once did. Their children struggle with having parents who cannot help them. These photographs were taken where these children typically do their homework. “I wanted to be an American soldier, and I’ve always wanted to live there. I wanted to flee this country,” said Jenő Balogh. 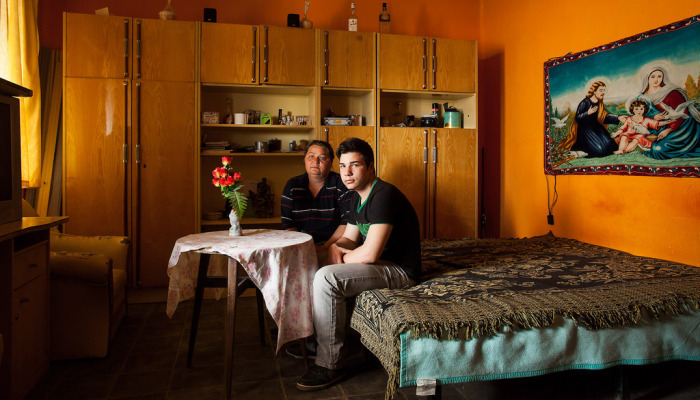 His parents were criminals so he was raised in boarding school where he finished only six of the eight grades. He was later transferred to a “correctional” school where he finished his elementary schooling. “It’s better to live an honest life. My children cannot have the life I lived,” he said. Amanda, his daughter, is 14 years old. She used to be a good student but that changed. 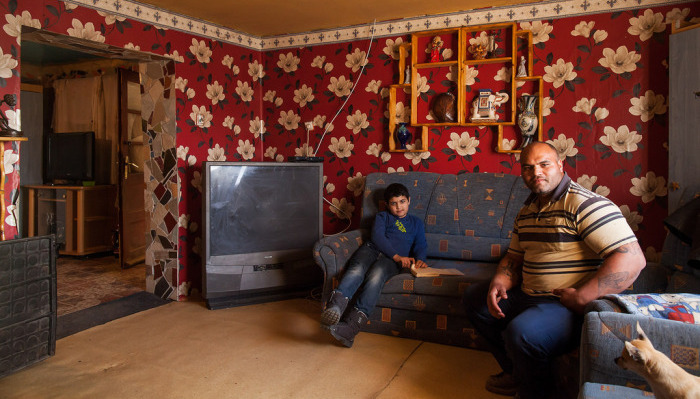 They moved to Budapest from Told because Jenő was able to find temporary employment in the capital, but Amanda wasn’t able to make the adjustment. “The teachers were good but I missed my friends,” said Amanda. Jenő said that when they lived in Told Amanda’s teacher would call them if there was ever a problem with their daughter. This never happened in Budapest. They eventually moved back to Told and tried to get their daughter back on track. “It’s not enough to be good,” Jenő said. “You have to be great,” continued his daughter. 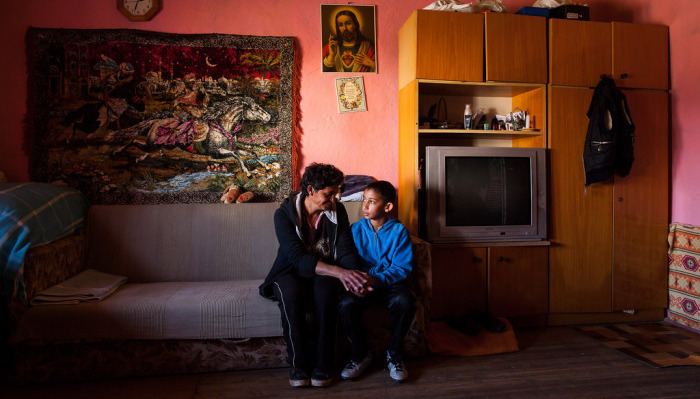 Julianna Seres lives with her children in Told. Her eldest son, Norbi, avoids going to school. Norbi’s little brother isn’t a fan of school either. Norbi spends his time scavenging for metal and lies to his parents about being in school. Julianna thinks there’s a possibility the state might take custody of Norbi. She doesn’t know what to do with him. He hangs out with his friends instead of listening to his mother. 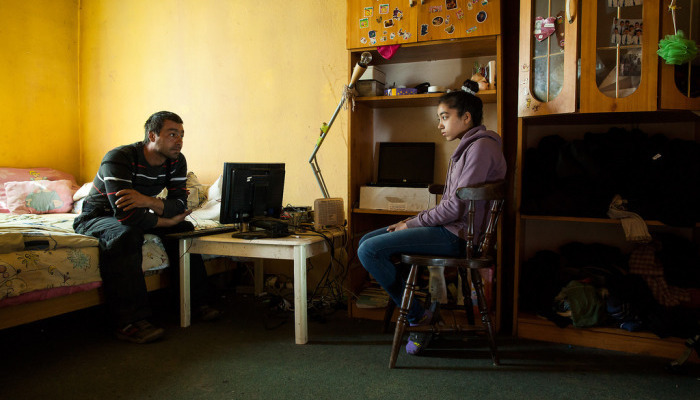 Julianna’s 18-year-old daughter, Betti, tried to continue her studies. She was given a scholarship to study at the Pallag High School run by the Igazgyöngy Alapítvány, a Hungarian foundation which helps provide an education for Hungary’s disenfranchised families. She left after a few days. “She was the only gypsy in a group of Hungarians, she didn’t feel comfortable there. They didn’t talk to her and she didn’t talk to them,” complains her mother. Betti quietly told us the experience was strange for her. She now attends a school that’s closer to home and is studying how to create decorative floral arrangements. She has no idea what she’ll do once she finishes, it was the only opportunity to study she had upon leaving the Igazgyöngy Alapítvány’s school in Pallag. “I have faith in my little Bella. Hopefully she’ll be successful in her studies and will be able to find her place in a normal environment,” says Julianna as she points at her youngest daughter who is currently studying on a scholarship provided by the Igazgyöngy Alapítvány. But Julianna isn’t of much help to her daughter when Bella doesn’t understand her homework. “[When I was her age] I never paid attention in school,” she said. Julianna’s parents were alcoholics. She spent her childhood doing household chores instead of homework. Józsi wanted to be a police officer. “People who are bad when they are kids will grow up to bad when they become adults. I don’t want to bad,” he explained. 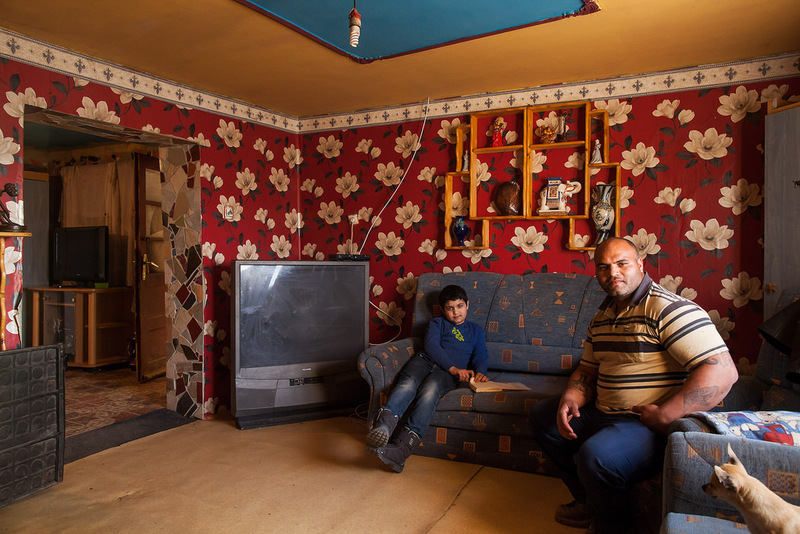 He spent the last 7 years living with his mother and stepfather in a house that only recently got electricity. They have to go out to the well for water. “I don’t want to be like my dad who is a public worker,” said Józsi. He says his dad makes promises all the time but never has the money to follow through with them. “Maybe next year,” says Józsi as he imitated his father. “A ‘B’ is a bad grade for her. There are times when she speaks German all day. I tell her, ‘Hungarian, my daughter, in Hungarian’,” said Tünde Oláh of her ten-year-old daughter, Tünde. Her daughter averages straight-As and she doesn’t even need her mother’s help. She does her homework on her own every night. She dreams of becoming a pediatrician. Her mother would have liked to become a hairdresser but she never finished school. She eventually became a seamstress. “I’m afraid they’ll drop out,” said Erika Rudolfné Bódi of her two youngest children. 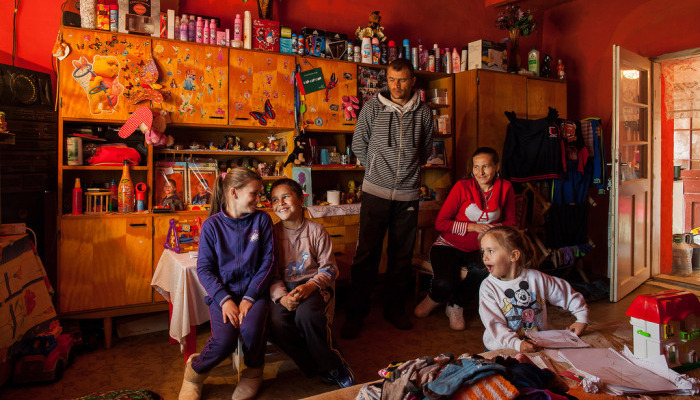 Sándor Ajtai raises his three children alone in a small house in Berettyóújfalu. He doesn’t have much time to help his kids with their schoolwork. He works all day, then cooks for the kids, and can give them about half an hour of his time in the evening. His partner hasn’t lived with the family for a long time. “It was tough with so many kids in the beginning but I’ve managed to rise to the task,” he said. He visits the baker in the morning to bring breakfast back for the children. His eldest son, József, started school a few years ago. He had to repeat second grade because he had difficulty paying attention during class. His father thinks the repeat was helpful because it made József much more serious. He enjoys drawing and reading. Sándor thinks József’s future occupation might have something to do with the arts. József shyly told us he wants to be a taxi driver. “Considering what’s required of her, she’s a good learner,” said Mónika of her stepdaughter Brenda. Mónika and Brenda rarely spend time together but they do read together. Brenda goes to the Igazgyöngy Alapítvány’s after-school tutoring program. Mónika hopes Brenda won’t follow in the footsteps of her son. “There was nothing that I could do for him,” she said. He often ditched school and eventually dropped out. Now he’s a temp worker in Balaton. Mónika was destined for the same when she was a student. She studied at the tourism school but dropped out because her family couldn’t afford the schooling. So she started learning how to sew but dropped out of that too. She now works as one of the Igazgyöngy Alapítvány’s local employees. “School went well. I was a ‘D’ and ‘C’ student but failed at math.” Zoltán Kolozsvári is 16 years old and is a special-needs student who finished only six grades of elementary school. He constantly left school early to help his sick father around the house. But that’s not why he dropped out. 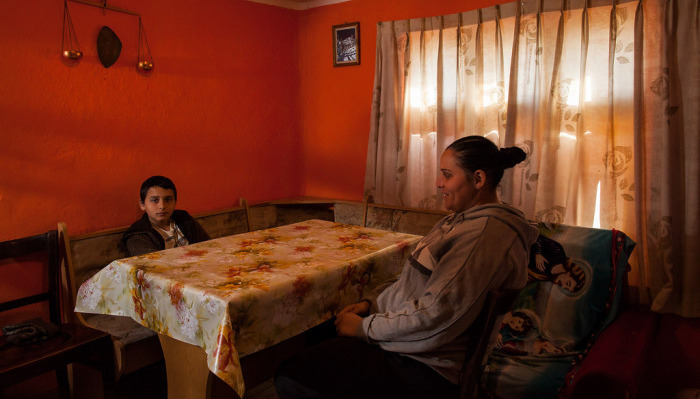 “I got a letter that said I’m no longer required to go to school.” He and his parents didn’t know what to make of the letter, so they didn’t tell the school that Zoltán would like to continue studying. That’s why Zoltán couldn’t attend any more. 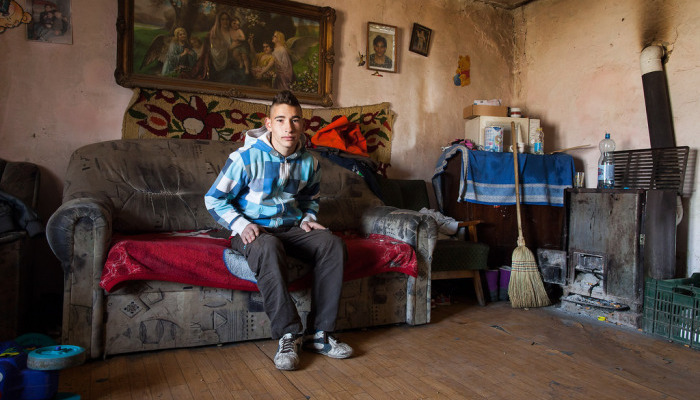 Zoltán doesn’t think he can do anything in life with only 6 grades of schooling, but he didn’t know how to answer when we asked him whether he’d like to continue going to school. He said he’d be willing to finish school but he doesn’t know how he’d be able to do it. He’d like to study in the agriculture program but doesn’t know when it starts or whether they’ll even accept him. Both of János and Ilona Mohácsi’s school-aged children are good students and receive scholarships from the Igazgyöngy Alapítvány. Dia is 10, Jancsi is 9. Ilona does help her children with schoolwork, but the kids prefer studying at the local tutoring center operated by the Igazgyöngy Alapítvány. “I’ve completed my elementary school. I’d like my kids to accomplish more than that,” said János. Jancsi wants to be a race car driver. Dia wants to be a florist. The kids were practicing math when we visited the family. Dia was showing Jancsi how to count. “I would study when I was at home and I would pay attention during class,” was how 9-year-old Heni explained her good grades. She studies alone and her older siblings sometimes help. Her parents only ask questions. She’d like to be a kindergarten teacher because of her younger siblings. Her parents, József and Klára, are proud of her but they don’t know what opportunities their daughter will have. Klára dropped out of school due to money problems. József, despite being a certified security guard, can’t find work in the area. József decided to get this certification because it was the only one that was free. “It hasn’t happened yet that I did not go out to play soccer with my friends even though I had homework.” Attila’s not a good student. He’s not interested in school and he almost never sits down at home to study. He likes physical education and information technology but the other subjects don’t interest him. He wants to be a baker. “I make her read the stories and then tell her to recite what it was about,” explains Julianna Tóthné Szűcs. That’s how she helps her daughter, Letti, with her schoolwork. She also supervises whether Letti has finished her homework and asks whether she has learned the required poems. Julianna never learned a trade but she would have gladly learned how to be a hairdresser or cosmetician. She was 18 when her first child was born. “I don’t want them to follow my example, I don’t want them to be stuck here,” she said. 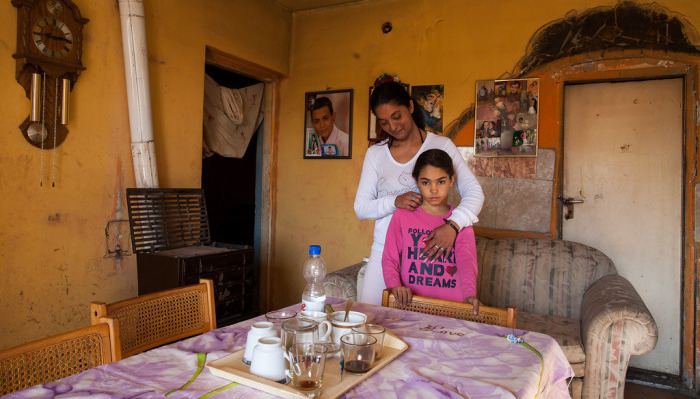 Her eldest daughter is studying to become a police officer and Letti wants to follow in the footsteps of her older sister. “Both girls became big girls and they’re a wreck. 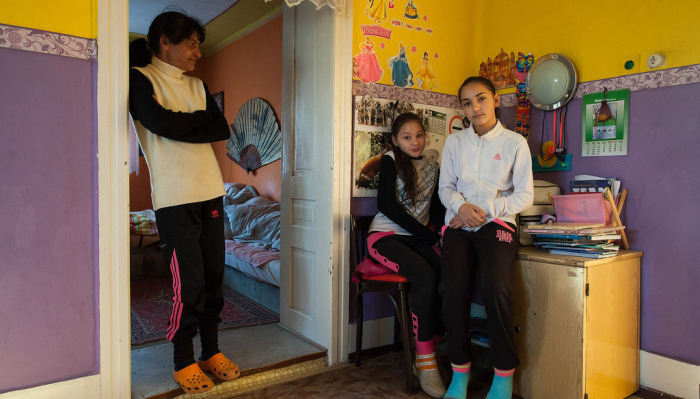 Their attention is focused on their girlfriends,” complained Magdolna of her two daughters, 13-year-old Judit and 11-year-old Zsófi. Instead of spending their time studying, the girls walk about the village. Earlier Zsófi was the recipient of a scholarship, and she was proud of that. Magdolna thinks she dropped out because she let her. “If I have to I’ll slap them, but they will not suffer for 50 thousand forint a month”. But she can only help them in as much as her circumstances allow. She often doesn’t understand what her daughters are studying. That’s when her sister-in-law, who is a teacher, comes over to help the girls. 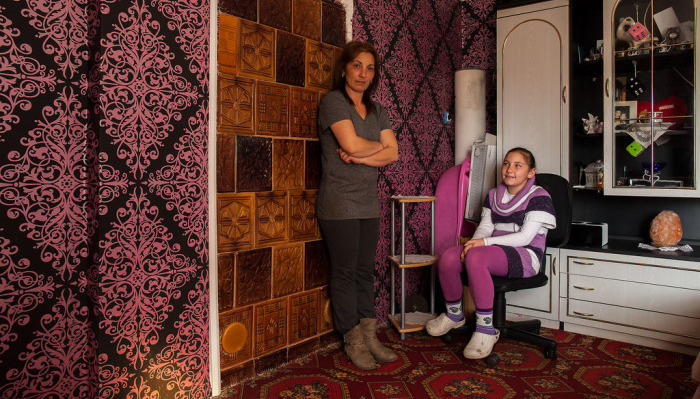 Her daughters often try to study at school, but that doesn’t really work. 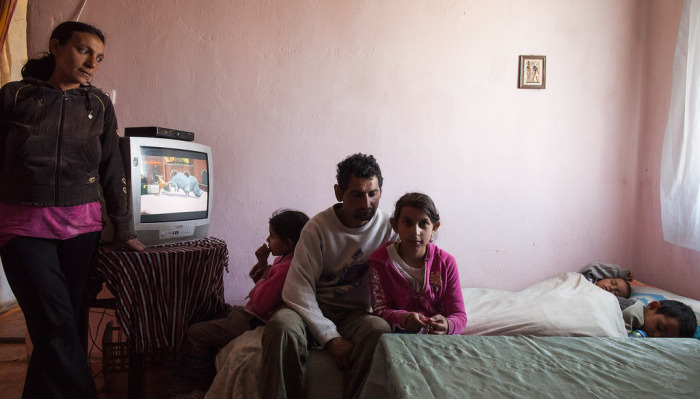 “There’s a lot of kids there, they often fight with each other,” said Judit. “I’d like for them to become teachers.” Magdolna has five cousins in the family whose kids have been able to accomplish something. One studied village tourism, a number of them even graduated from high schools and learned a trade. It’s an entirely different question where they’ll find work in the village. That’s why there are so many public works workers. This article was prepared with the help of the Igazgyöngy Alapítvány.